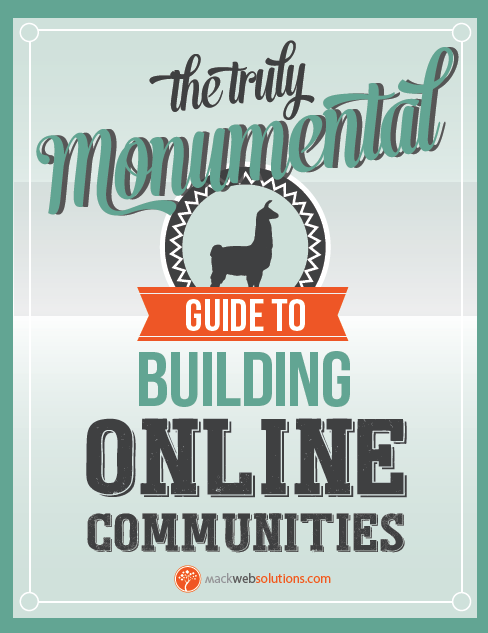 The Truly Monumental Guide to Building Online Communities is a free book (pdf with 147 pages), you can pick it up online here: Mack Web Solutions. It promises to help companies who want to build an engaged audience around their brand. 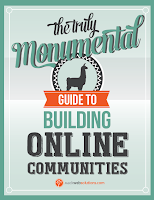 If you have no audience at all, it will help you to build a community of lifelong customers, but the book is also for companies who would like to improve their existing communities. These communities consists of your current and potential customers, your peers, the leaders/innovators in your industry, and the visionaries from any field that inspire you. The book targets mostly Internet-based companies, but I'm sure someone who hasn't an Internet-based company can find some valuable insights from it. Provide valuable advice or insight to your community. This is the most important advice - you can't build a sustainable online community without a great product with valuable content. For example, this book review will hopefully be valuable content to my community. You don't have to be on every social media platform known to man. And never automate social media. You need to be aware of what's happening and engage as a human with humans. Or as the book concluded, "The absolute best way to build community is to remember that you are a person among people." This is similar as the thoughts by Gary Vaynerchuk and his book "The thank you economy." He built a wine store by interacting with people on Twitter for seven hours a day. Building a community is not a process with an end - no matter how large it becomes. It's rather common that large companies tend to forget about their respective community as they grow.